A Fashionable Fête: If you’re a nail salon owner, there are certain occasions when a party is absolutely necessary. A grand opening usually sits at the top of that list. If, however, your business is located in an area where there are other nail salons, the challenge becomes throwing a different kind of celebration that will make yours stand out. 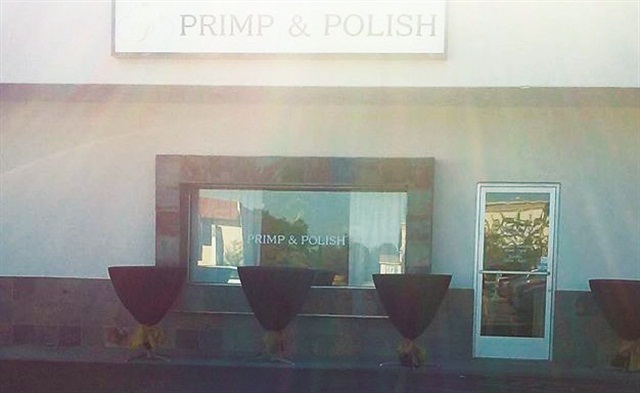 On the heels of New York Fashion Week was the grand opening of Primp & Polish, a nail salon located approximately 20 minutes south of San Diego. The salon had technically been open for a month already, but owner Valeri Zuniga wanted a stylish celebration to rally the community around its new nail headquarters. Since Primp & Polish is a luxury nail salon specializing in Crystal Culture nail services and offering the likes of Louboutin polish, a glamorous affair focusing on wellness and beauty became the goal. Nail tech Reyna Martinez suggested the salon put on a fashion show so that the public could view fall/winter trends for both clothing and nails. Martinez was particularly inspired by CND’s runway designs from the previous season, leading her and nail tech Jazmine Sanchez to execute drips and chains on long almond-shaped tips. Striping tape with clusters of crystals along with various patterns, glitters, and foils made up the remainder of the tips that the two prepared a few days before the show. When it came to finding a supplier for the runway fashion, Zuniga opted to partner with online retailer A Gal in Her Pink Truck. “I thought it would be a unique opportunity to collaborate with someone who has the same passion. We also wanted to give our clients a fun night out,” says Zuniga of their collaboration. Other local businesses came forward to have mini booths at the event and contributed to a grand prize raffle drawing. Keeping with the theme of wellness and beauty, vendors ranged from Aflac Insurance to Cali Girls in Vegas ( in-home shopping boutique and party planners), Make-Up by V, and Vanity Lash & Beauty Academy. Prior to the runway presentation, the public was welcome to mingle, enjoy cocktails and snacks, and take photos in the salon. By the time the show began it was a packed house, with people crowded outside the salon windows to get a glimpse. Five looks walked the runway, and each model made sure to stop and let the front row examine her nails. While the fashion show was what everyone had waited for, the speech Zuniga gave afterward was the real grand finale. Zuniga piggybacked off the fashion presentation to speak to the public about the benefits of choosing Primp & Polish. “Our top priorities at Primp & Polish are client safety and sanitation,” said Zuniga, who went on to explain the salon’s offerings and commitment to client health. She informed the audience about sterilization, autoclaves, the salon’s Footsie Baths, and the dangers of MMA. Nail techs Martinez and Sanchez were also invited to speak about their nail creations. One brave audience member even asked how long a chain could stay affixed on a nail. This question proved that even though the opening had brought people to the salon, the nails were what got people talking. 1. Choose your partnerships wisely. Having perfect runway presentation means having hair, makeup, clothing, and styling in addition to flawless nails. Collaborate with local hair salons, retailers, lash artists, estheticians, and other beauty professionals to show potential clients all that’s possible with these services. 2. Maximize your space. Work with the space you have and rearrange manicure tables and supply extra seats to accommodate models and guests. Zuniga even used the far corner of her salon as a backdrop for photos. 3. Make the nails relevant. The runway nails shown at Primp & Polish, much like those shown at NYFW, aren’t meant for everyday wear. Have wearable versions ready to offer clients after the show. 4. Do your research. You and your nail tech should be prepared to speak about the trends you are noticing as well as the techniques you use. “I always begin by consulting with my clients to see what their lifestyle is like,” explained Martinez to the audience. 5. Extra details are everything. Even the cupcakes served at the event had lashes, making them the perfect advertisement for the lash studio exhibiting at the event. 6. Incentivize. Goodie bags always go a long way. Primp & Polish gave away an OPI mini polish, cuticle oil, and a nail menu to every attendee. Making the event even more worth people’s while were the three grand prize raffle drawings. Two winners each scored $100 gift cards to Primp & Polish and A Gal in Her Pink Truck, and one lucky winner received a free set of lashes. Raffle tickets were only $1 apiece and were purchased at the bar, making them easily accessible.